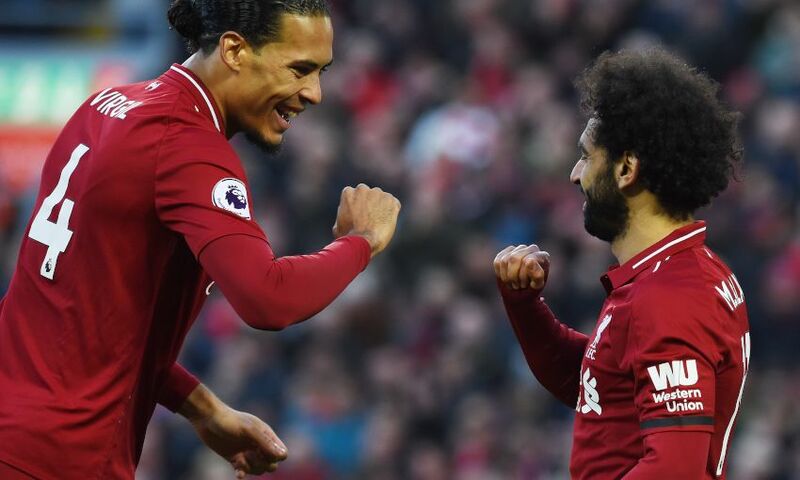 Sadio Mane, Georginio Wijnaldum and Mohamed Salah were on the mark as Liverpool returned to winning ways with a 3-0 victory over Bournemouth at Anfield on Saturday. The success saw the Reds go three points clear at the top of the Premier League ahead of Manchester City’s meeting with Chelsea on Sunday. The battle cry came from their King and Kopites delivered. All the nerves and anxiety of recent weeks were swept aside as Liverpool returned to the top of the Premier League table in style. 'Unity is Strength' read the banner on the Kop and this was the revitalised Reds operating as one powerful united force. They were unstoppable. “When it gets towards the finishing line that’s when you need them most of all,” declared Sir Kenny Dalglish on the eve of Bournemouth's visit. “The fans can get them over the line with their support.” The message to embrace and enjoy this title race rather than fret about potentially falling short got through loud and clear. Anfield was bouncing from start to finish as that thunderous encouragement helped inspire a dominant display and a resounding victory as they re-established their three-point lead over Manchester City. Jürgen Klopp paid tribute to supporters' group Spion Kop 1906 in his programme notes and rightly so. They had taken a stand against the negativity which had seeped in following the insipid draws against Leicester and West Ham. They had mobilised a fanbase to show up early and make a difference. The volume levels throughout were more akin to a big European night. Here was the power of Anfield. The improvement in all departments was vast. On the day that Klopp urged fans to 'fasten their seatbelts' for the run-in, Liverpool took the handbrake off. The front three of Salah, Roberto Firmino and Mane were back to their dazzling best as they tormented Eddie Howe's side. The return of the outstanding Gini Wijnaldum, who overcame a sickness bug which ruled him out of training on Friday, added class and control in midfield, while alongside him Naby Keita's Liverpool career took a massive step forward and Fabinho impressed once again. After two draws – yes, that constitutes a mini-crisis these days – Klopp’s side are back on track, and back on top of the Premier League. Just as importantly, they looked back to their old selves in dispatching Bournemouth at Anfield. This was their 20th win from 26 league games, and it was achieved in a style which suggests the disappointment of Leicester and West Ham is already forgotten. Those seeking to crown Manchester City as champions will have to wait. Klopp had insisted in the build-up to this game that talk of pressure and nerves was irrelevant as far as his players were concerned. “Our only tool,” he said, “is football.” They used it well here, scoring picture-book goals courtesy of Wijnaldum and Salah, after Mane had headed them into a 24th-minute lead. That strike meant the Senegal star has now scored in four successive Premier League games for the first time in his career. With a dozen league goals, he is now level with Eden Hazard and closing on Harry Kane, Sergio Aguero and Pierre-Emerick Aubameyang. That’s some going. Salah has been Liverpool’s headline-grabber over the past 18 months, but Mane’s consistency, and his importance to this title challenge, must not be underestimated. Hungry, selfless and deadly, the 26-year-old represents everything that is good about Klopp’s side. His ovation as he left the field here, replaced late on by Divock Origi, was both rapturous and deserved. Wijnaldum, restored to the side after a minor knee injury, had brought drive and composure to proceedings, and both were in evidence on 34 minutes as he broke the lines to latch onto Andy Robertson’s astute pass, bring the ball down with one touch and then, with his second, lift a gorgeous effort over Artur Boruc and into the net. Think Robert Pires against Peter Schmeichel, and you’re pretty much there. Klopp received a triple fitness boost in the build-up to today’s game, with Jordan Henderson, Trent Alexander-Arnold and Wijnaldum all recovering from injury in time to make the squad. But it was telling that only one of that trio featured in today’s starting line-up - and didn’t he prove why. This season, Wijnaldum has established himself as the man who makes Liverpool tick in the middle of the park courtesy of a potent mix of positional nous, vision, and patience in possession. And, while the Dutchman doesn’t get forward to score goals quite as often as during his early days at Anfield, his wonderful first-half finish showed he hasn’t lost his touch. The Reds desperately need his latest injury lay-off to be the last of 2018-19 if they are to win the title. It looked like it might never come during a rare two-game goal drought, but Salah is now finally on 20 goals for the season. The Egyptian is the first Liverpool player since a certain Luis Suarez to achieve that feat in consecutive campaigns - is there a better testament to his brilliance than that? Last year’s 44-goal haul won’t be repeated this time around, but he won’t care a jot if there’s a trophy at the end of it. And it is performances like this - featuring unselfish play as well as deadly finishing - that will increase the likelihood of a happy climax to the campaign. Keita was in fine form here, and his confidence only seemed to grow as the hosts added goals. The outside-of-the-boot pass to Roberto Firmino in the build-up to the third goal was a thing of beauty, and there were plenty of moments of similar brilliance from the Reds’ No.8 throughout. Somehow, there is a perception in some quarters that Salah’s form has been slightly underwhelming this season. That is, of course, a falsehood based on his almost surreal contribution to the 2017-18 campaign. Salah has been as key to Liverpool’s progress this season as he was last season. That is now 17 Premier League goals in 25 appearances, a class-leading return. But in a mood like this, irresistible, the havoc he creates also opens the door for others. Salah himself cracked one against the crossbar when long odds-on to strike his 50th Premier League goal for Liverpool. It was down to Wijnaldum to demonstrate the finishing art when he collected Andy Robertson’s pass and lifted a lob over the statuesque Boruc. It is hard to overestimate the importance of Wijnaldum to Klopp’s process. His intelligence and energy provide the perfect link between this vastly improved defence and this peerless attack. He has developed into an integral part of the Liverpool system.